It was already a shell-shocked community beginning to say their farewells to possibly a quarter of the town’s residents, with those left behind worrying about the future of a town with a decimated economic foundation. 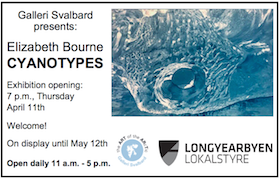 Either alone ranks among the most significant events in Longyearbyen’s history. Together they may reshape the town more dramatically than at any time since it was almost entirely destroyed during World War II. Both will completely reshape the world’s northernmost town – in vastly different ways during the coming year – although each will require a massive rebuilding process that will take years. No, we didn’t get a product placement payment or many cases of their product for including one of many new businesses in town during the past year (another full disclosure: somebody Absolutely Not Acting As An Errand Boy For The Brewery delivered a case to the abysmal abode mentioned above several days later after we refused to accept one from the company directly). But they were unquestionably the most high-profile and an indicator of the small-scale efforts that may be a critical part of the community’s post-coal future. 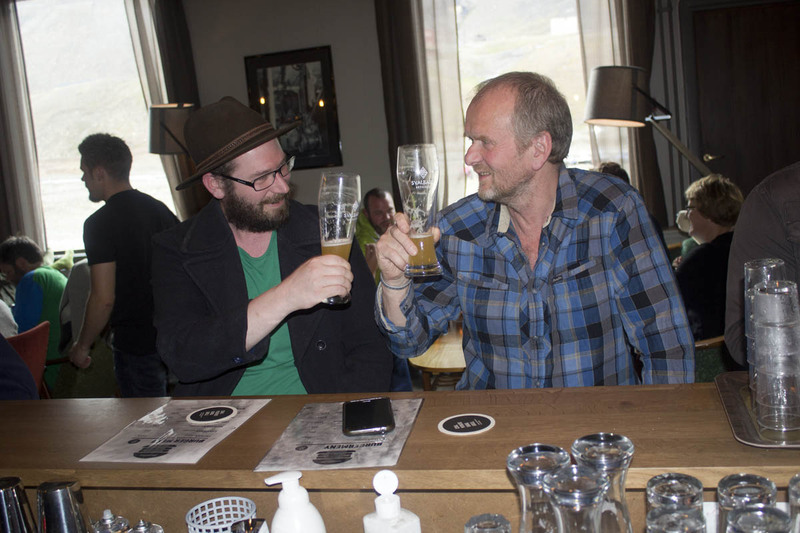 It took six years of struggle to change a ban on manufacturing alcohol in Svalbard for Robert Johansen to realize his dream. And when he did, not all the reviews were raves – as it turns out brewing beer from local glacier water means accounting for certain properties he and fellow entrepreneur Andreas Hegermann Riis didn’t count on. But a few startup glitches aside, Svalbard Bryggeri’s debut resulted in global headlines and requests for the local suds to be sent to areas far beyond its initial distribution points. Other startups during the year ranged from a paint company with corporate titans such as BP among its clients to a kebab truck staffed by a single person with no food service experience. 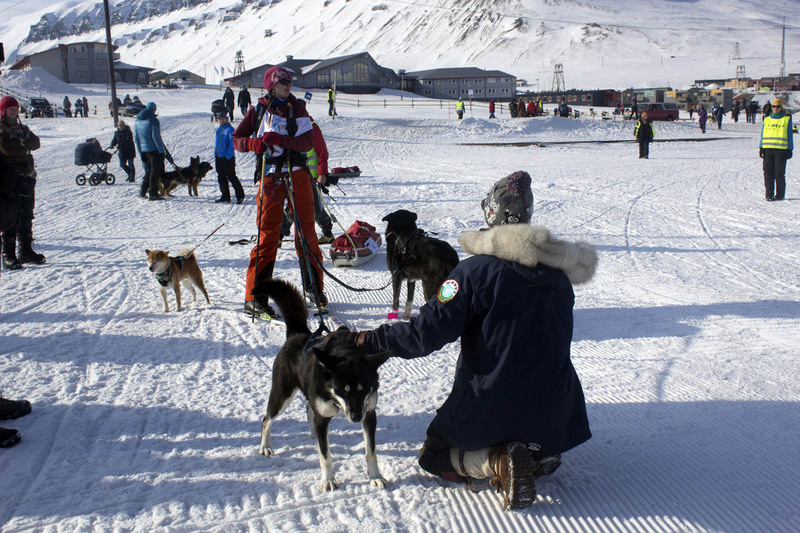 But with the community, local officials and Norwegian government putting a heavy emphasis on small businesses as part of Longyearbyen’s rebuilding plan, even non-drinkers ought to raise a toast to a prototypical example. We’re not dog people (or cat people, for that matter), but when a flu epidemic cuts dogsledding tours in half and threatens to infect the town’s entire canine population even those of us who would dine on the species in certain Asian countries (we’ve eaten – and enjoyed – whale on special occasions here and at a church potluck at the northern tip of Alaska, because for a few moments we allowed cultural respect to prevail over political correctness) offered the chance tend to sit up and take note. The first-known cases of a disease known as respiratory infection known as kennel cough were detected in March and by early April had spread to an extent that some tour companies cut their offerings in half. Some dog owners predicted all of their animals would eventually be infected, but the crisis ultimately passed without huge impacts to businesses or dog lovers. Norwegian and European Union leaders make the first “withdrawal” of seeds from the Svalbard Global Seed Vault in September to ensure Syria can replace essential species destroyed by war. Photo courtesy of the Norwegian Ministry of Agriculture and Food. 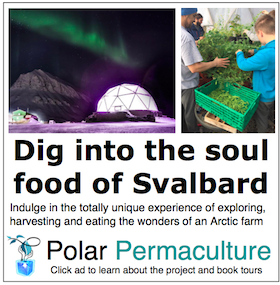 Ask a local how often they think about the Svalbard Global Seed Vault and the answer will probably be a shrug. Ask a visitor about the Doomsday Vault and the answer will likely involve fascination, along with possibly a rant about zombies or evil corporate demons planning Bond-like schemes to conquer the world. But regardless of whether inhabitants of our “visitors stay away” vault has long-term plans of annihilation, the facility played a notable role in one of the biggest global stories of 2015 as the first-ever “withdrawal” of seeds occurred in September after a smaller gene bank was decimated in the war-torn country. The seeds are being stored in a neighboring country for the time being, but will ensure vital crops will be replanted when people are able to. That wasn’t the only help Longyearbyen gave the country whose refugees are now being vilified by many throughout the world. An auction and other fundraising activities in September – spurred largely by the community’s lone Syrian resident – raised more than 300,000 kroner. 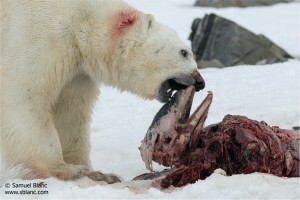 A Svalbard polar bear eats a white-beaked dolphin that was much further north than usual during the spring. Photo by Sameul Blanc. True Believers would argue this deserves the top spot for…well, at least as long as this humble tree-killing fishwrapper is around. And while we can kind of understand their point – mass extinction of people, cities, animals, plants, etc. does make the avalanche seem like a lesser thing – the problem is more of those things will need to happen before it registers higher on the public’s scale – and ours, at least in terms of this list. 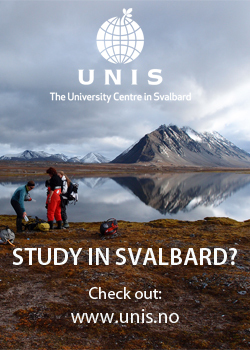 Still, it’s exasperating to see so many “apocalypse is inevitable” studies and headlines based on highly skilled research in Svalbard and know that it’ll just be shrugged off as junk science by climate skeptics and the profit-minded titans who argue scientists want people to give up their SUVs out of meanness. Without even reading the stories, here’s a few examples from headlines of the past year: “Polar bear seen eating dolphins for first time; climate change blamed, skeptics still shrug”; “10,000-year-old ice shelf likely to vanish in a few years; climate skeptics shrug”; “Sea level to rise ‘only’ 17mm if Svalbard’s glaciers melt.” Erosion is threatening to destroy existing homes as well as historic ones; the governor authorized the first-ever excavation at Bjørnøya this summer to study and preserve numerous buildings, fossils and other artifacts in danger of being swept away forever into the seas. 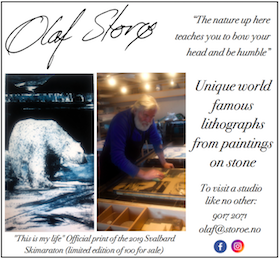 If he was merely the Undisputed Svalbard Web Troll Of The Year he’d be on our strangest stories list. But Russian Deputy Prime Minister Dmitry Rogozin (one of multiple people with that title, by the way) managed to make his unwanted visit in April more than a middle-finger salute as outraged Norwegian officials altered long-term rules granting easy access for most people to the archipelago. 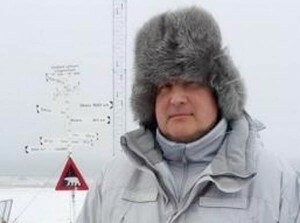 Rogozin made a brief visit to Longyearbyen and Barentsburg before departing to watch a massive military training exercise near the North Pole, defying a ban on his entry into Norway and other Western countries due to his role in the Ukraine crisis. His entry was legal, however, since Svalbard has different entry requirements than the mainland. A prolific social media user, he further inflamed tensions by calling the Arctic “Russia’s Mecca,” and comparing Svalbard and other regional areas to Crimea, which was annexed from the Ukraine. Oh, BTW, that millitary exercise at the Pole was supplemented by nuclear subs/fighter jets buzzing our borders on numerous occasions and announcements of plans to deploy missiles on nearby islands on the other side of their border. Norway responded by enacting a new rule allowing the deportation of people from the archipelago if they are also banned on the mainland due to sanctions or other restrictions. 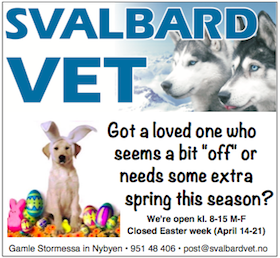 Airlines are also required to submit the names of all passengers on all scheduled and charter flights to Svalbard. Climate change activitists and deniers both got something to be cheerful about just before Christmas as the first census of Svalbard’s polar bears indicates there are about 975 polar bears in the Norwegian region of the Barents Sea, up from about 685, despite several years with poor sea ice cover during the intervening period. Moreover, the bears were fat and happy. The four-week census was supposed to tally the entire bear population in the Barents Sea region, but Russia backed out of a commitment to allow the count on its side of the border for reasons never made entirely clear. The Norwegian survey was also hampered by bad weather which limited visibility and prevented scientists from reaching some areas by ship and helicopter, forcing the researchers to rely more on estimates than planned. The booming bear population predictably resulted in lots of gleeful insults toward scientists, greenies and others who’ve been warning the diminishing sea ice poses an existinal long-term threat to the species. Which is still true but – as with people who say the planet isn’t warming because their town had a colder-than-expected winter – there’s no reason an isloated snapshot in time can’t be used as definitive contrary evidence to decades of global studies. Ida Christine Aske Lima, an employee at Kroa, poses with Pete and Bret Leduc, both of Los Angeles, inside Fruene during a visit by the men to Longyearbyen in May. 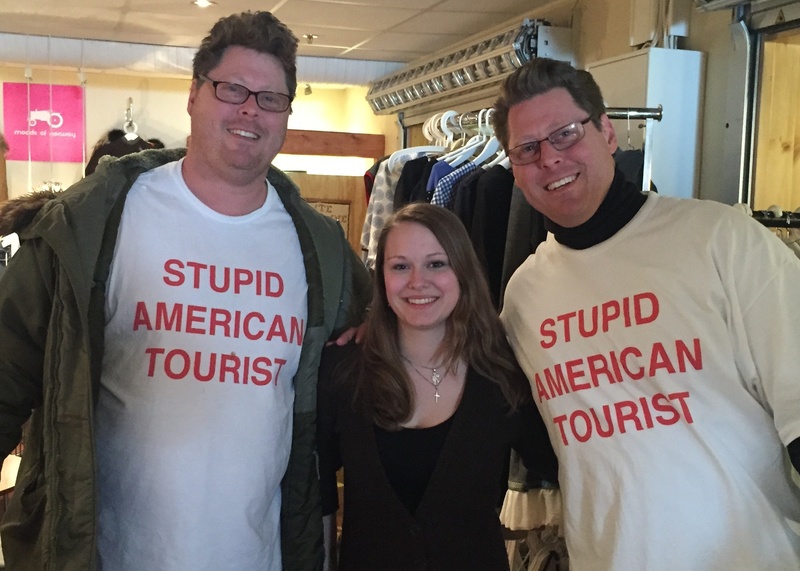 The men are wearing custom t-shirts they obtained in 2013 for their foreign travels. Photo by anonymous contributor. 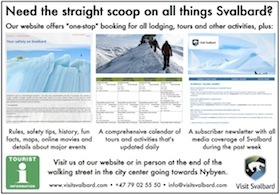 A certain event a few notches higher on the list didn’t hurt, but during a year when the cruise industry was sweating the effects of a ban on heavy oil that kept large ships away from many of Svalbard’s most popular areas it turned out tour operators in Longyearbyen largely fared remarkably well. Major companies like Basecamp Spitsbergen and Green Dog Svalbard reported sales reached an all-time high. 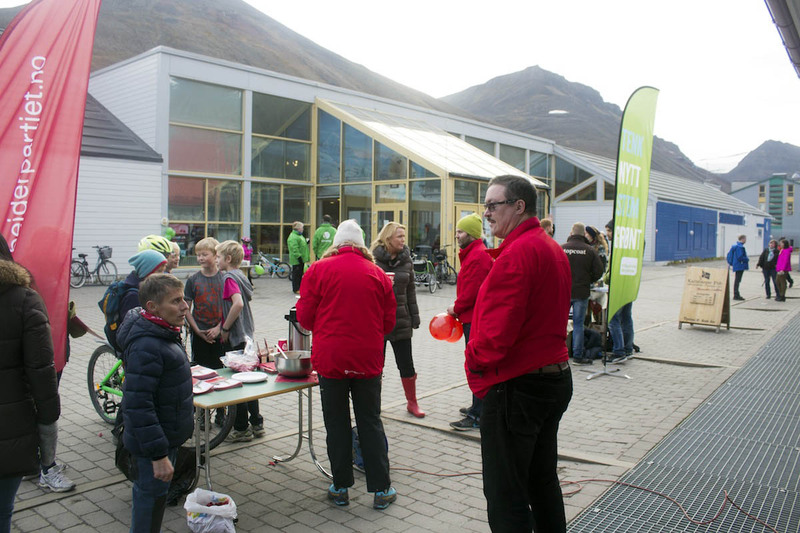 While many popular areas were closed to the mass of summer cruise tourists spending a single day in Longyearbyen, new offerings aimed at multi-day visitors here the rest of the year bridged the gap and continued to expand the “busy” tourism months. Even Store Norske, gloomy as its future might be, is taking advantage of the opportunity by opening its abandoned Mine 3 as a mining museum and for guided tours. 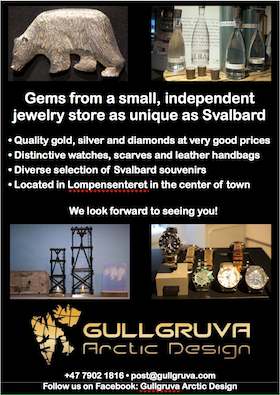 It is also scheduled to begin tourist visits to Svea for the first time early in 2016. 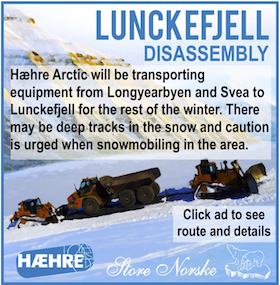 The unprecedented drama before and after the Longyearbyen Community Council election exceeded the actual impact, as in the end the Labor Party retained its leadership and ensured a sharp change in direction policywise is unlikely. Candidates representing two of Norway’s major political parties replaced members of two minor parties on the ballot, but conventional wisdom and a Svalbardposten poll showed Labor was likely to retain or even expand its presence on the 15-seat council. But when the vote counting started on Election Night it quickly became clear there was an open battle for who would rule – and one or both of the new parties would make an instant impact in the role of kingmaker. The Labor and Conservative parties each won fives seats – a loss of two for the former and a gain of two for the latter. For a fleeting moment the votes were aligned in way where it looked like the Green Party might determine the council majority despite winning a single seat, but ultimate that power went to the Liberal Party which won three while the Greens upped their total to two. 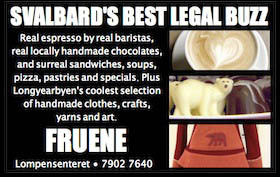 The immediate assumption by nearly everyone after the election, including by top-ranked Labor candidate Arild Olsen, was the Conservatives would take over by forming a coalition with the Liberals (while perhaps an odd concept to foreigners, a similar coalition exists in Parliament). But negotiations dragged on for a few weeks until literally a couple of days before the new council was sworn in, at which point Olsen announced Labor would indeed control an expanded majority in a coalition including the Liberal and Green parties. A researcher works on the sea ice near the Lance on Jan. 15, fours days after the ship departed Longyearbyen to begin its six-month mission. 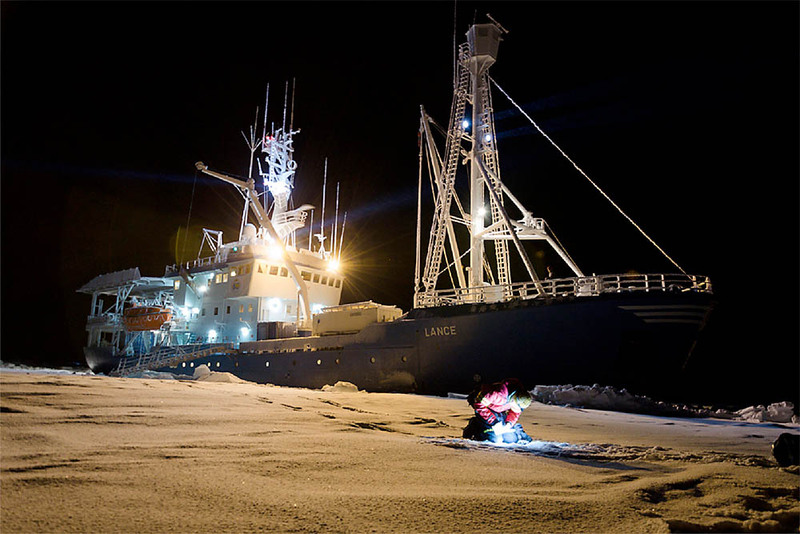 Photo by Harald Steen / Norwegian Polar Institute. There’s not exactly a shortage of people studying the Arctic ice sheet and how climate change is affecting it, but researchers will be spend years pouring over the data collected by one of the most ambitious projects in the history of the Norwegian Polar Institute. And even laypersons inclined to scoff will likely be appreciating the images from participants and media organizations from around the word, if the ongoing coverage of the project that ended in June is any indicator. We could try to explain the mass of research, photos and coverage, or we could just send you to the expedition’s official website. 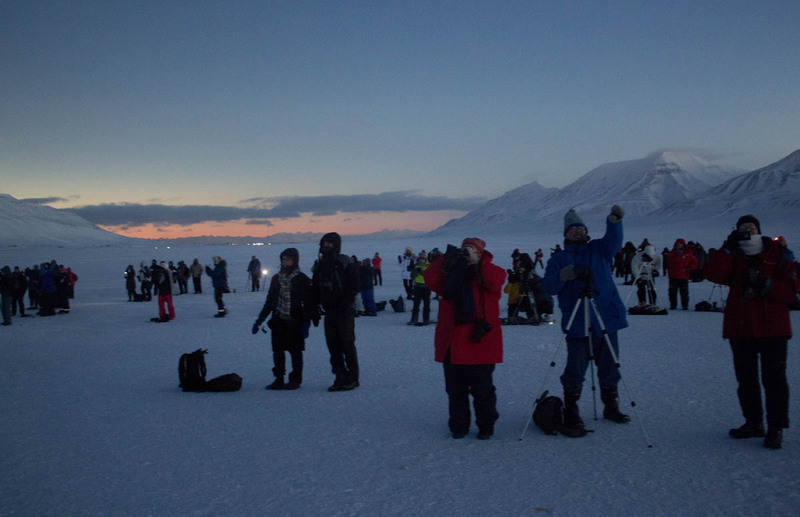 Hundreds gather in Adventdalen to experience the peak 147 seconds of the total solar eclipse in March. Photo by Mark Sabbatini / Icepeople. 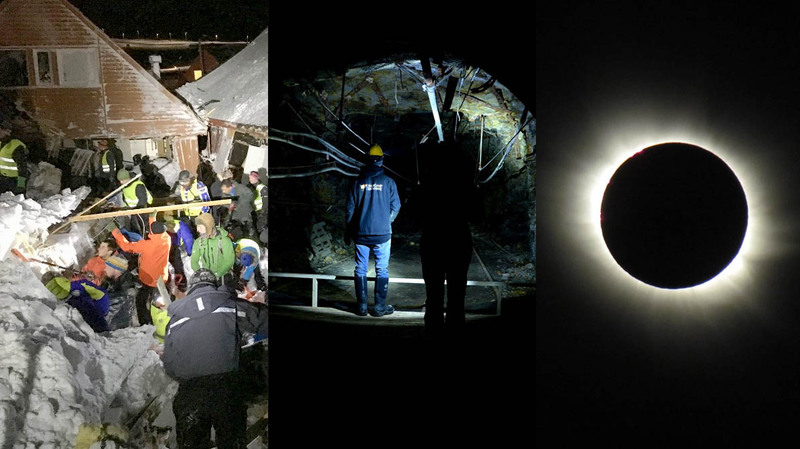 Considering hotel rooms were booked many years in advance and desperate skywatchers were paying more than 20,000 kroner a night to rent homes from private individuals, there was no way the event was going to live up to the anticipation…right? During the week beforehand, it certainly seemed that way. The skies were cloudy and for the most part highly stormy, with people resorting to seeking shelter in tents watching them blown away along with hopes of getting a memorable experience for the exorbitant sums they were paying for the privilege of being here. But the sun rose in a suddenly clear sky on the morning of March 20 and what followed between 10:11 a.m. and 12:20 p.m. was a tale for the ages. While we still don’t fully understand lingo like “diamond ring” and “prominence” – and it’ll be 2061 before we need to again – apparently every one of those terms that mattered during the 147 seconds Longyearbyen was plunged into midday darkness during a time other than the polar night. 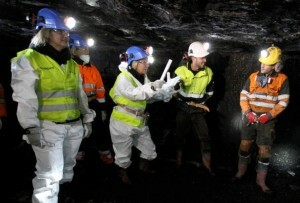 Norwegian Minister of Trade and Industry Monica Mæland, center, visits Store Norske’s mines during one of multiple visits during the past year. to discuss the company’s financial crisis and future. Photo courtesy of the Norwegian Ministry of Trade, Industry and Fisheries. If anyone wants to argue this is the true top story of the year rather than the tragedy of the moment, we’d be doing a lot of hemming and hawing coming up with a counterargument. The former is the near death of the century-year-old foundation of the community, the latter a momentary tragedy that killed two people. But signs of the end of mining as a dominant local industry were evidence late last year when Store Norske was reporting records losses due to collapsing coal prices and stating the company would go bankrupt without a huge amount of government assistance. At that point, it was just a question of when the “head shot” would be fired. A lot earlier than most thought, as it turns out, as a government bailout of 500 million kroner intended to keep the Store Norske alive through 2016 wasn’t enough as a further drop in coal prices – and revised company losses for 2014 of nearly double the already record-setting levels – had the company again facing insolvency during the fall of 2015. The board of directors asked the government in September to approve 285 million kroner to suspend operations at its largest mine for up to three years, but a reply didn’t come until literally days before Christmas. 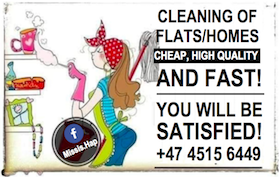 But the government’s recommendation – which must be approved by Parliament next spring – can hardly be classified as hostile. They’re recommending up to 400 million for the pause in operations, in addition to an incentive package of 50 million kroner for other local businesses and infrastructure. 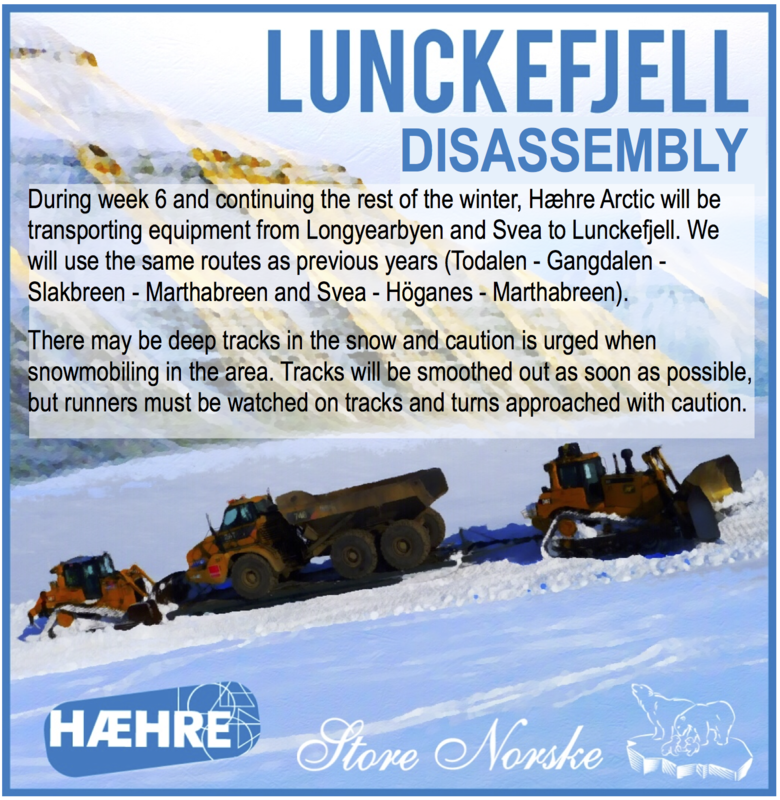 But with Store Norske downsizing to an expected 98 employees by next summer – compared to about 400 in 2012 – there’s no denying the impact will be devastating since several hundred of Longyearbyen’s 2,100 residents may depart when associated industries and families are factored in. 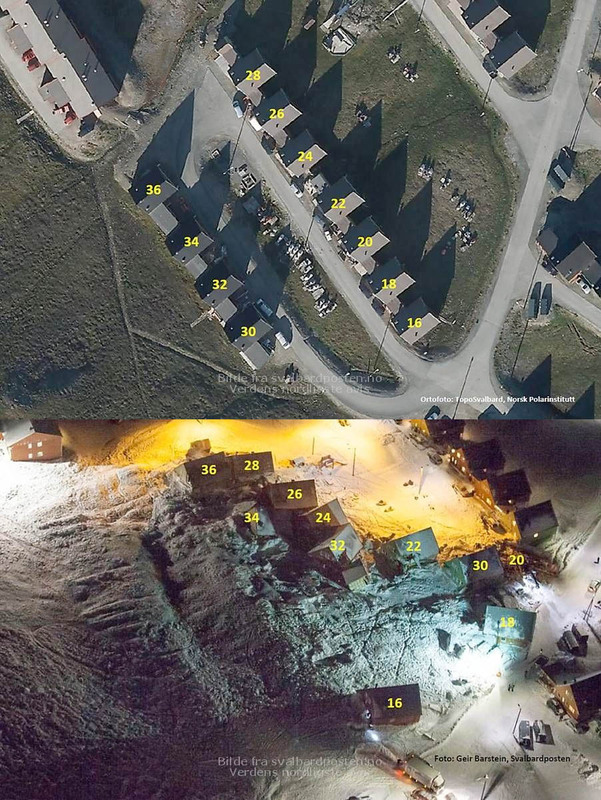 Rows of homes on Vei 230 are shown before and after the Dec. 19 avalanche that hit 11 structures. The addresses of the homes are noted in yellow. Before photo by the Norwegian Polar Institute. After photo by Geir Barstein / Svalbardposten. About 5,000 tons of snow in a wave 200 meters wide and four meters high, moving at 80 kilometers an hour. That’s what struck 11 homes near the center of Longyearbyen on Dec. 19, killing two people, and leaving permanent physical and psychological scars on the community. The avalanche was triggered by one of Svalbard’s worst-ever storms, with heavy snowfall accompanied by winds up to 120 kilometers an hour. The storm did widespread damage elsewhere, including blowing the roofs off Longyearbyen School and a student dorm in Nybyen, and breaking a sewage pipe that ended up blocking the road near Huset. The worst of the storm passed by about 8 a.m., but at roughly 10:20 a.m. the avalanche struck, burying five adults and four children inside their homes. More than a hundred rescuers and volunteers who brought their own shovel dug frantically to extract the victims, one of whom was saved by banging on a microwave oven with her hands to make enough noise to be heard. 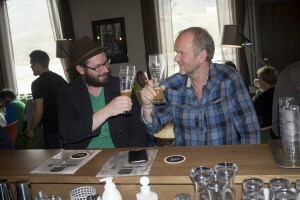 Atle Husby, 42, a musician and Longyearbyen School teacher, died before rescuers could reach him. Nikoline Røkenes, 2, who was buried with her sister, Pernille, 3, in a nearby house for two hours, died a day later at a hospital in Tromsø. About 180 residents were forced to evacuate homes beneath mountains on the east side of town and, as of the end of the year, 80 were still prohibited from returning. City leaders say they are planning to analyze all areas considered at-risk after the avalanche to determine if they are unsafe for people to live in. But officials assessing the avalanche’s impact, and the response by agencies and individuals, said the tragedy could have been much worse.